This tutorial shows how to create active PDF links using the Professional edition. novaPDF is a PDF creator that allows generating PDF files from any Windows application that supports printing. If you don't have novaPDF installed, use the Download page to download and install it. Any visible text that starts with "http://", "www", "mailto:", "ftp://" or "file://" in your original document can be converted to clickable PDF links if you choose so (hidden links and internal links are not converted). In the novaPDF Printing Preferences window click on the Links tab. Enable link detection by checking the Automatically detect URLs in text option. If you have in the original document links to local files, those can be detected and converted too by enabling the Detect file names and convert them to PDF links (is recommended to select the Check if file exists before linking option, so you'll be sure the link is valid). 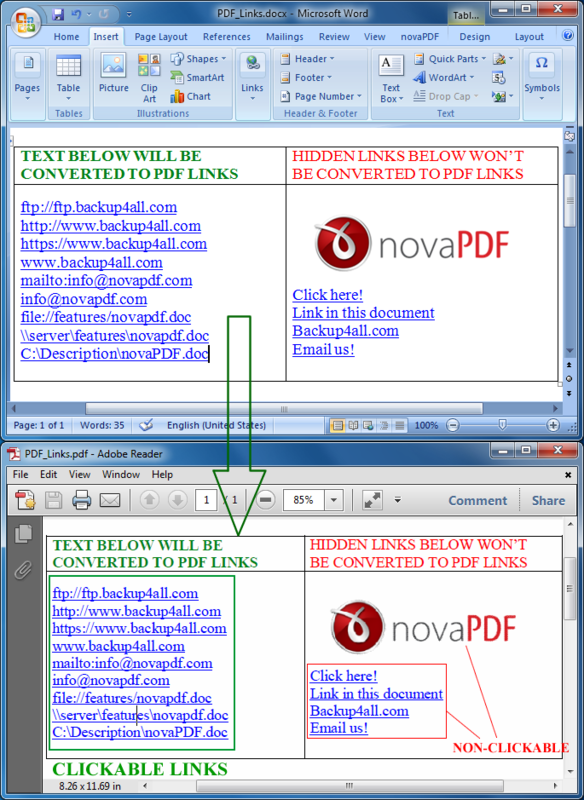 Update: Starting with version 7 it is possible to create active PDF links with novaPDF Standard too. Furthermore, add-ins for Microsoft Word and Excel are currently available, which will allow the conversion of the "hidden" hyperlinks described above, but only from the applications they were created for. novaPDF is a PDF creator for Windows that can convert any printable document to a PDF file. On this page you can find several PDF example files that were created by novaPDF from various programs.